Well, folks, another apple season has gone out with a bang—or, more literally, with a “snap!” Here in Palermo, Sunday's blizzard pounded our apple trees with over a foot of snow in a very short time. With the leaves still there to catch all that snow, large branches snapped off with the snow's weight, and many of our young trees were bent all the way to the ground. Thankfully, with the help of the neighbor's plow—and with the melting power of the sun on Monday—we were able to get our buildings and driveway cleared just enough to pack the apples in time for this final distribution. As much as we lamented the inconvenience of moving all the apples in the snow and slush, we were lucky that the storm didn't come a day later! We're grateful that it all worked out, because we're featuring some of our all-time favorites in this week's share, and most of them are good keepers as well. We sincerely hope that you've enjoyed sharing the apple season with us, and that you're inspired to go Out On a Limb in search of many more interesting fruit experiences! are calling out to be put in a pie, but you won't be disappointed if you eat either of them as a mid-morning snack. They are amongst the most versatile of apple varieties, and we think you will be fans before spring rolls around again. One note on the Tolman Sweets and Northern Spy - beware, both bruise easily so handle with care. Happily for the clumsy among us, unlike the earlier apples, these two will not rot if they are bruised, but still treat them gently. Our apples come to you straight from the tree, so, as with all fresh produce, please be sure to wash them thoroughly before eating. Unless otherwise specified, the apples are grown using Integrated Pest Management by the orchards we collaborate with throughout Maine. "How Do I Store My Apples?" Because this seems to be the most frequently-asked question among our shareholders, we decided that this week's article should be devoted entirely to a lesson on apple storage. We recognize that everyone's storage capabilities are different, therefore we'll try to cover all the bases (refrigerator, root cellar, etc.) so that you are equipped to get the longest life out of your apples. If you follow the guidelines laid out below, you could be eating and/or cooking with apples well into Winter and—depending on the variety—early Spring. The optimal storage conditions for apples are: 30-40 degrees F, and 80-95% relative humidity (RH). Within that range, colder and more humid is the best (30-32 degrees F, and 90-95% relative humidity). In many cases, it will be hard to sync both temperature and humidity. If you can keep the fruit near 32 degrees, you can get away with a little less humidity (80-85% RH). On the other hand, if you can only get the storage temperature down to 40-50 degrees, then make sure to raise the relative humidity to 90-95%. Some people run humidifiers in their storage space, while others simply mist the fruit periodically through the winter. As a general rule of thumb, apples held at 40 degrees will age and decay twice as quickly as those held at 30 degrees. Apples held at 50 degrees will age twice as fast as those held at 40 degrees. At 70 degrees, the speed of deterioration doubles again. Due to the high sugar content of apples, they will freeze at a lower temperature than water. The “freezing point” of apples ranges from 27.8 degrees to 29.4 degrees. If apples do get frozen, their quality will quickly deteriorate—the flesh will soften, and rot will ensue. Every apple is a living organism. Once harvested, the fruit cannot obtain nutrients from the tree, and because it is still respiring (breathing in oxygen and breathing out carbon dioxide, just like humans), it begins to use up the energy it stored up during the growing season. As this energy is used up while in a cellar or refrigerator, the sugar, acid, and starch content of the fruit change. At some point, these processes cause the tissue to break down, and the fruit becomes mealy or rubbery, and it eventually rots. Therefore, the goal of storage is to slow down the breathing of the apples, in order to slow down the ripening. Furthermore, cold temperatures will retard the activity of the bacteria and fungi that cause decay. Shriveling is caused by rapid respiration of the fruit (the apples are using up their reserves in response to an environment that is either too dry or too warm). However, shriveled fruit is perfectly fine to cook with, because the cooking process naturally softens the fruit. If you're like some of us on the farm, you may find that the altered texture doesn't bother you enough to prevent you from enjoying the raw fruit out of hand. If you are storing your apples in a refrigerator, be sure to keep the apples in perforated plastic bags. The plastic will help retain moisture (refrigerators are drying agents), and the perforations will allow carbon dioxide to escape. In the absence of perforated bags, you can use unperforated polyethylene bags, but do not tie them shut—once the fruit is cooled in the refrigerator, simply fold over the open ends. If you don't have enough refrigerator space and your cellar or basement is too warm, you can try storing your fruit in insulated containers in an unheated room or outbuilding—but be sure the temperature in the containers doesn't drop below 30 degrees! Whatever storage facilities you have available, try to keep the temperature consistent. Large temperature swings will cause more respiration and thus faster decay. It is best to store apples in shallow layers, because there is less chance of bruising the fruit on the bottom with the weight of the fruit on the top. Shallow layers are also easier to inspect and pick through! Wherever you determine storage conditions are best, make sure you can access the fruit on a regular basis, in order to: a) monitor how the apples are doing, make adjustments if necessary, cull any rotting fruit, and—most importantly—procure fruit to use! Perhaps you have heard the adage, “The best fertilizers are the footsteps of the farmer.” The same principle holds true for storing apples: the apples that keep the best are those that are monitored and cared for regularly. , by Mollie Katzen, I made a vow to myself to cook every recipe in it. Stained, coverless and very tattered, it doesn't get as much use these days as it did when I believed every recipe needed to have cheese in it to be tasty, but I do haul it out and sort through the loose pages every now and then. That was the case back in September when I was trying to use up the last zucchini of the season. I looked up my favorite recipe for Zucchini-Feta Pancakes when I noticed that on the opposite page there was a recipe for Apple-Cheese Pancakes that I had never tried. So last week in an effort to brighten yet another rainy day, I decided to make them for lunch. True to form I did not have all the right ingredients - no ricotta or cottage cheese - so I substituted plain yogurt and they were just fine. Very light and flavorful. Not everyone at the table needed syrup. Mollie Katzen said that any apple would work well, except Red Delicious. I bet she had no idea of the number of choices that would leave. If you use a sweet apple, put in less honey. If you chose in a tart one, try lowering the amount of lemon juice. Mix everything together except the egg whites. Beat the egg whites until stiff and then fold them into the batter. Fry the pancakes in butter or vegetable oil over medium heat until they are brown on both sides. Serve with maple syrup, preserves, yogurt, or fruit. And if you just need to have a little cheese, try grating up some cheddar and adding it to the batter. It oozes out of the pancakes as it cooks and makes a little ring of crispy fried cheese around it. Kinda delicious. I found this recipe on a scrap of paper stuffed into my apple recipe folder. I had no idea where is came from so I decided to see if I could learn more about it. Turns out Eve's Pudding is a traditional British apple dessert named after the original apple eater. There are almost as many ways to make it is there are apple varieties to use, but it is always described as an apple base with a sponge-cake top. Sponge cake makes me think of Twinkies, but this dessert bears no resemblance. The topping gets firm and crisp above and the cake underneath stays light and moist. Other recipes that I found called for raisins instead of almonds so give that a try if you can't eat nuts. I thought the almonds gave the topping a nice crunch. All the Brits say Eve's Pudding must be served with custard which I didn't do because I needed a dessert in a hurry, but I will definitely try it with custard next time. However, I thought it was excellent just as is. Beat the butter and sugar together until light and fluffy. Beat the eggs into the butter-sugar mixture one at a time. Combine the flour, baking powder and salt and fold into the butter mixture. Fold in 1/3 cup of almonds. In a separate mixing bowl toss the apple slices with the lemon juice, lemon rind, and brown sugar. Spread this on the bottom of a 9"x13" ovenproof pan. Spoon the dough over the apples in an even layer (although it won't be very even). Sprinkle the remaining 1/4 cup of almonds on the top. Bake 40-45 minutes until it is risen and golden brown. Serve warm with custard or cream. That's it for this season! 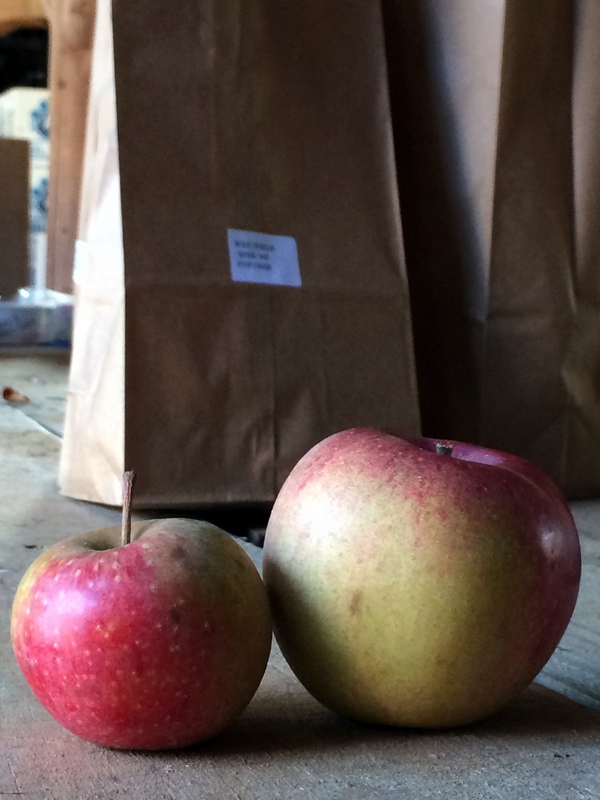 Thanks for joining us for our sixth year offering rare heirloom and modern apples. We hope your winter is filled with delicious apple pies, crisps, and cobblers. We know ours will be!